As a rite of passage, menopause impacts every woman as she enters the later years of life. While menopause offers a bridge to an improved sense of self and peace of mind, this life transition holds the reputation as one of misery. In other words, the beauty of this relatively short season is sometimes overshadowed by the negative. Yes, menopausal symptoms, such as hot flashes, raise dread in those approaching the 50-year mark and complaints from those already there. However, lifestyle changes, particularly diet adjustments, decrease these symptoms. In particular and to the point, sugar control begets hot flash control. In looking at the link between blood sugar levels and hot flash occurrences, the perspective is important. For women, the body changes continually from childhood growth through puberty, possibly pregnancy, and nursing, through to aging and into menopause. Adapting to these bodily changes can become wearisome if you don’t take care of yourself. Keeping a positive perspective as to the miracle of the female body and adjusting as necessary brings you to menopause in a healthy state of mind. This outlook combats the negative impact of many of the menopausal symptoms you may experience. It may help to keep in mind that the one constant in life is change. Simply put, menopause is the cessation of a woman’s menstrual cycle and the closure of her reproductive years. This natural, biological process happens when the ovaries stop releasing eggs. An end to fertility, menopause does not signal an end to sexuality, vitality or health. Typically, this change of life occurs after age 40 with the average age of around 51 years in the United States. However, hysterectomies, chemotherapy treatments, and other factors may lead to early or premature menopause. The definitive call that menopause has been reached is when a woman goes 12 months in a row without a menstrual period. During perimenopause or the several years before menopause, the ovaries’ estrogen production levels gradually decrease. The quick drop in estrogen one to two years before menopause often brings on symptoms. The years following menopause, known as postmenopause, reveal a reduction in these issues. — Joint and muscle aches. 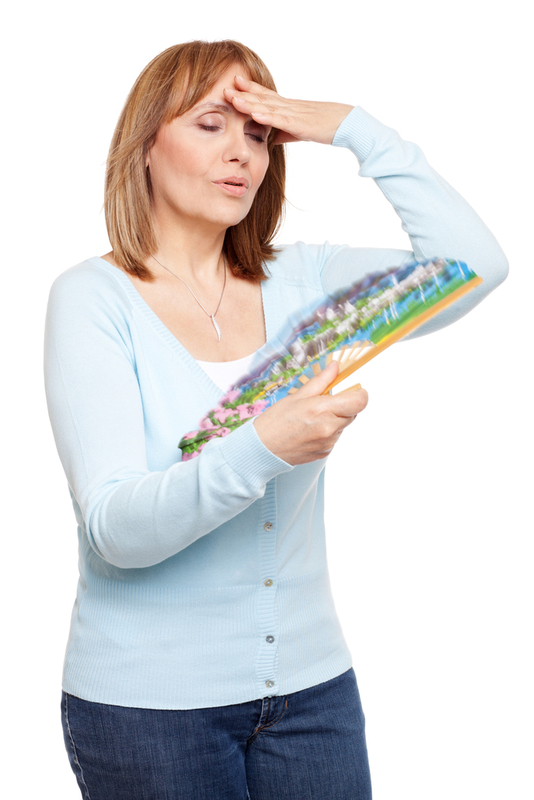 Hot flashes are the most commonly experienced symptom of menopause. In fact, perimenopause finds 75 percent of women experiencing this vasomotor symptom with a 50-percent occurrence in postmenopausal women. However, the severity and length of hot flashes and other symptoms varies. In other words, just as menstrual cycles and pregnancies reveal each woman’s individuality, so does menopause. The sudden rush of heat over the upper body common in menopause is referred to as a hot flash. This symptom may also be called a hot flush when accompanied by a red, flushed face. Sweating results in more extreme variations of hot flashes. When overheating and sweating occur at night, doctors use the term night sweats. The exact cause of hot flashes continues to elude medical professionals, but the role of estrogen fluctuations is clear. Experts believe that estrogen changes impact the hypothalamus as it works to regulate body temperature. Also, this vasomotor symptom occurs when blood vessels lying near the skin’s surface dilate. Your body’s estrogen fluctuations also affect these blood vessels. Reducing, rather than eliminating, these occurrences are the best solution. In other words, no magic cure for hot flashes exists. While the intensity of hot flashes tends to decrease over time, some women experience them for life. The flash and flush cycles are only part of the trouble. Discomfort and embarrassment, depending on where a hot flash chooses to erupt, accompany this symptom as well. Hot flashes at night that disrupt sleep exacerbate your energy levels and cause fatigue. Shakiness, confusion, and weakness may result from this fatigue. The goal of control regarding menopausal symptoms, including hot flashes, remains stabilizing estrogen and other hormone levels. Stabilized levels of hormones, rather than wildly fluctuating hormone levels, bring fewer symptoms and less intensity of symptoms. — Opting out of tight-fitting clothing options. — Eliminating exposure to cigarette smoke. However, easy and effective dietary changes remain a key combatant of menopausal symptoms. In fact, according to the American Journal of Clinical Nutrition, women who followed a Mediterranean diet experienced a 20-percent decrease in hot flashes and night sweats. So, what role does diet play in menopause? A healthy diet stabilizes hormones. This includes mediating estrogen fluctuations. Once estrogen levels even out, temperature regulation becomes more effective, while your body reduces flushing and excessive perspiration. Even better, dietary changes can alleviate other symptoms as well. Theories float about as to why the Mediterranean diet offers relief. First, abundant fiber in this meal plan links to insulin and cortisol regulation. Second, the low glycemic index of these choices leads to more controlled blood sugar levels. These stabilizing effects decrease vasomotor symptom occurrence and intensity. While the high fiber, low glycemic index of foods in a Mediterranean diet reduce the instances of vasomotor symptoms, the opposite holds true as well. A significant increase of hot flashes occurs in women with diets high in saturated fats and sugar. Yes, glucose spiking high or dropping low triggers menopausal symptoms. In fact, diets high in fat and sugar led to a 20-percent increase in hot flashes and night sweats based on a study of over 6,000 menopausal women. Another study revealed 33 percent higher glucose levels in women reporting hot flashes one to five days per week. Also, this relationship between glucose levels and vasomotor symptoms increases the risk of cardiovascular problems. The glycemic index indicates the degree to which regarding causes a blood sugar spike. Foods low on this scale tend to impact blood sugar less drastically, In other words, they stabilize blood sugar readings. This control over blood sugar is linked to fewer vasomotor symptoms. Furthermore, blood sugar spikes tend to be followed by quick drops. Hot flashes may result at this time as well. However, a diabetic hot flash differs from a menopausal one. With any vasomotor symptoms, diabetics are wise to check blood sugar levels. Mistaking a hot flash for a blood sugar low is dangerous and potentially deadly. Several components of a Mediterranean diet lend clues to healthy eating in terms of reducing menopausal symptoms. Garlic, peppers, olive oil, fish, salad greens and whole grain pasta of this diet hints at ways to lower the incidence of vasomotor symptoms. Incorporating these ideas into your diet brings relief. While an overall healthy lifestyle adds to the benefits, a dietary change is a great place to begin. Considering the components of a Mediterranean diet, the following modifications offer your ways to decrease hot flashes and night sweats. The alterations prove to be easy to manage. Even better, you might find your overall health and quality of life improves with a Mediterranean diet. — Choices containing high fiber such as legumes, fruits, vegetables, whole grains, nuts, and seeds. Strawberries, mango, melon, and pineapple, especially, have a great impact on menopausal symptoms. — Foods that contain healthy fats like nuts, olive oil, fish, and avocados. — Whole grain options while limiting portion sizes of carbohydrates. — Lean protein sources for blood sugar stability. — Red meat while opting for leaner cuts of meat. — Processed foods with their added calories and sugar. — Hot foods, such as soup or oatmeal, which raise body temperature. — Spicy foods that heat the body up on their own. — Coffee, particularly with sugar and cream added. — Alcohol consumption; if you must, keep to a glass or less per day. — Saturated fat to less than 20 percent of the total daily diet. — Simple sugars to less than 10 grams per meal or snack. — Eating regularly timed meals and snacks to avoid blood sugar spikes and drops. Six to eight small meals per day are recommended. — Try cinnamon. Some experts recommend Ceylon cinnamon as a natural blood glucose stabilizer. Adding this spice to daily cooking routines could lower blood glucose levels by three to five percent. Hot flashes seem to need sugar intake to fuel them. Controlling glucose consumption in terms of simple sugars and working to stabilize blood sugar levels reaps benefits. Through various avenues, the link between sugar and hot flashes grants valuable insight into reducing the incidences of menopausal symptoms and their intensity, particularly of the vasomotor nature.